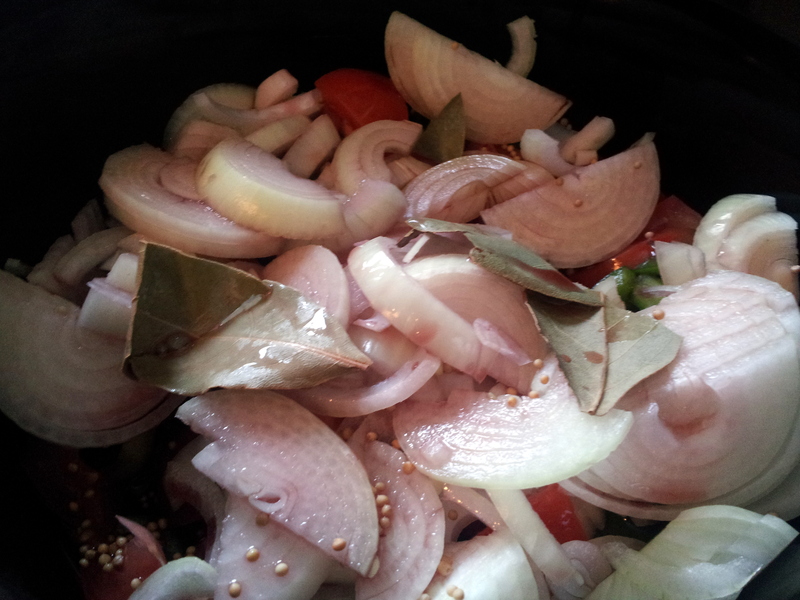 Adventures in Slow Cooking- Light Beef Stew – Food. Boom. Keep your onions thinly sliced for better slow cook results. Another Saturday, another chance to try for a decent dinner out of the 2014 Valentines gift that is my slow cooker. As previously reported, successes have been sporadic so far. This week there was a pack of casserole beef and a rare unfinished bottle of red to be had, so a beef stew seemed obvious. Results were on the pleasing end of the satisfaction scale and the below method should yield a tasty, not too hefty dinner dish with a fragrant and tasty but thin liquor. It’s not quite a soup, but not as weighty as some traditional stews including my previously billed recipe based more on a flammande style. The big lesson of this week is to again shy away a little from the dump and go method and take time to quite thinly slice the veg, especially the onions as often the slow cook fails to completely tenderise big lumps of veg and the softer they get, the more flavour they release. To begin, a glug of olive oil in the cold slowcooker pot. Now finely chop the onions and tomatoes and add to the cold pot. You can afford to go a little chunkier with the green peppers, then add these to the pot along with the wine, stock and seasonings. I prefer the lighter finish of veg stock with this kind of stew, though you could use chicken or beef stock as required. Dice the beef and dust with a little plain flour. Melt a good sized knob of butter in a frying pan with just a touch of olive oil to avoid it burning. Only when the pan is good and hot, add the beef (best done in 2 batches unless you have a mahoosive pan). To test the heat, drop one chunk of meat in, it should sizzle immediately. Keep the beef moving in the pan only long enough to seal then transfer to the slow cooker pot, along with the juices from the pan. Give it all a good stir, you should have enough liquid to just cover the other ingredients. Put the lid on then leave on high setting for at least 5 hours. As previously said, you may wish to keep some stock on side to top up the liquid levels depending on your personal tastes but make sure it is hot before you add it. Taste the stew at this time and adjust seasoning as you wish, if the liquor is too thin add a handful of split red lentils which will soak up some of the excess and then dissolve nicely into the sauce. Leave to cook for another hour, then serve. 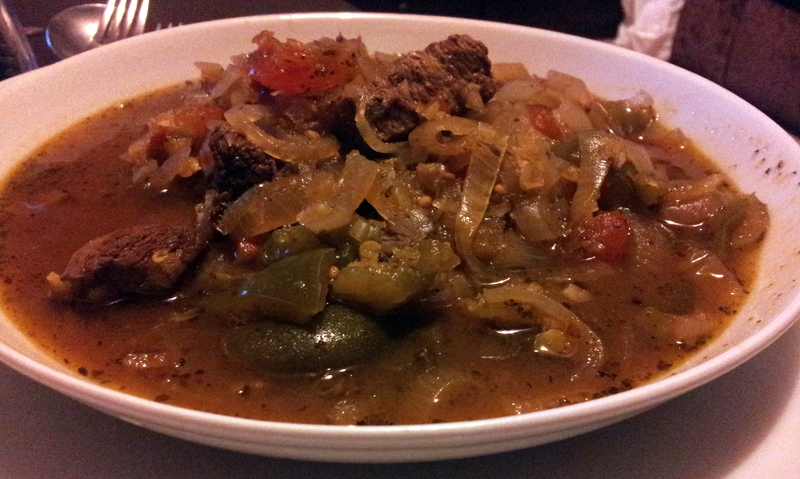 Simple stewed beef with onions and peppers in a light broth.